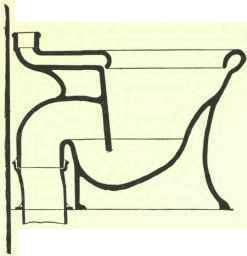 Important as the question of external drainage is, the whole system would be a failure if the internal fittings were not of the best quality; and of all sanitary fittings the w.c. is the most important, in the choice of which too much care cannot be exercised. 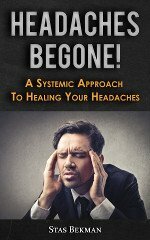 Although this has in a great measure been superseded by the washdown, it has still many advocates, and possesses some important advantages. The illustration (Fig. 196) shows a Doulton's Valve Closet. 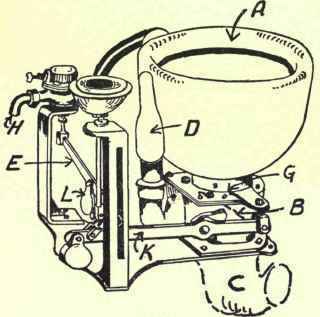 It consists of three parts: the basin, the valve box, and the trap. (1) It has a large water area to catch the faeces. (2) A double seal, and close fitting valve. (3) The foul air presses against the lower trap, saturates the water in it, and the gases are taken to the outside by the vent pipe. A. Earthenware basin with flushing rim. B. Valve box of cast iron, enamelled white inside. D. Overflow from basin, connected to valve box behind valve. E. Arrangement for regulating the supply of water. G. Flap valve, with rubber flange to keep water in basin (shown in dotted line as if open). H. Supply pipe admitting water into basin. K. Lever for opening and closing the basin valve. L. Weight for shutting the supply valve. These fittings, in most cases, act satisfactorily, but need a little attention, and, unless this is likely to be given, it is better to select some other form of closet. A wooden casing is generally considered necessary (although it serves as a harbour for dirt), as the complicated working-parts are unsightly, and are liable to catch in articles of clothing. The water supply is wholly dependent on the person using the valve closet, the water running as long as the handle is held, until the cistern is emptied. This frequently leads to waste of water, and precludes the use of the closet in many districts where there is a restricted supply. (1) The pan should hold a body of water large enough and deep enough to quite submerge the faeces. (2) It should have no places where faecal matters can cling to or accumulate on. (3) It should have a water seal of at least 1 1/2 inch for trapping off the soil pipe. (4) It should be so constructed that the whole of its contents may be changed by a flush of two gallons of water, and its interior parts well flushed. Washdown closets are made in two forms, either in one piece including the trap, or in two pieces with the trap separate. The latter is the better, as the pan is easily repaired without breaking into the drain, a good example being Doulton's "Simplicitas" (Fig. 197). Like all good types of this closet, it is simple and cheap. It is made in pedestal form, well spread out to carry the weight, is fitted with a lift-up seat, and requires no casing. The water area is large, and deep enough to submerge the faeces. The flushing rim is sufficiently large, and the trap has a good seal, whilst the vertical connection for the down pipe from waste-water preventer obviates the use of a rubber cone, or the more objectionable rag-and-string joint. "Any person who shall connect a stoneware or semi-vitrified ware trap, or pipe with a lead soil pipe, waste pipe, or trap communicating with a sewer, shall insert between such stoneware or semi-vitrified ware, trap, or pipe, and such lead soil pipe, waste pipe, or trap, a socket of copper, brass, or other suitable alloy, and shall insert such stoneware or semi-vitrified ware trap or pipe into such socket, making the joint with Portland cement, and shall connect such socket with the lead soil pipe, waste pipe, or trap, by means of a wiped or overcast metallic joint; provided always that it shall be sufficient if he shall connect the stoneware or semi-vitrified ware, trap, or pipe with the lead soil pipe, waste pipe, or trap, in an equally suitable and efficient manner." 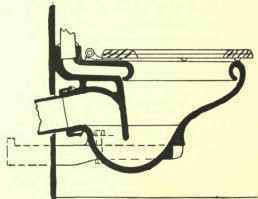 In connecting an earthenware pipe or closet to a lead soil-pipe, a socket is formed on the lead pipe by means of a plumber's "turning pin." The end of a brass collar or ferrule is fitted into this. Tallow is rubbed over the parts on which solder is to be placed, and then molten solder is poured around the joint and "wiped"into shape. The brass ferrule is jointed to the earthenware by means of a ring of gaskin (hemp), and neat cement is run in and wiped round. Pathogenic germs are retained in the hemp, and many authorities prefer the use of rings of some other material, such as rubber. In some cases the trap is made of lead instead of earthenware, so as to obviate this difficulty. 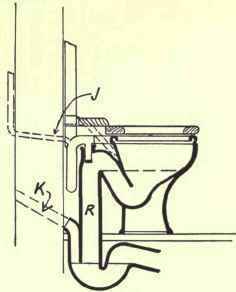 Probably the best joint is that known as the "Mettalo-Keramic" joint, a patent of Messrs. Doulton & Co. A short piece of lead pipe is fused by a patent process on to the trap, and the entire incorporation of the pottery and metal at the point of junction is effected. The so - called Hospital Closet, of which Messrs. Doulton & Co.'s pattern is illustrated in Fig. 198, has the trap kept off the floor and fixed on brackets, so that it can be washed down, and wiped over externally with a duster, thus obviating the collection of dirt and dust.